I think it was the first time I love bees when I saw the Alexander McQueen skull ring. In the Spring Summer 2013 show yesterday in Paris, they had surprised people with exaggerated head pieces and glamourous couture. 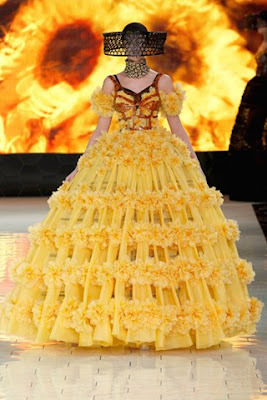 By using beehive and golden embellishment, the collection showed women's power and strength in their real life. As you may know (or not), there is only one queen in the beehive and queen bee is the greatest role there. 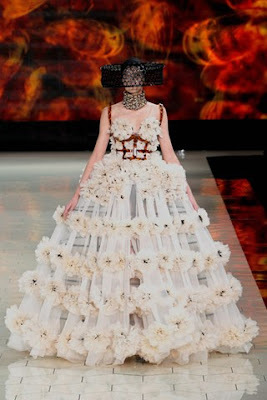 I guess this represents there is only one Alexander McQueen in the fashion industry, the one who always surprises people with great works and every garments are masterpieces. The show had lots of extravagant accessories and embellishments and the tortoise corset was such an artwork. I always think that McQueen is challenging the extrema of human being. Crazy high heels, huge dresses, and delicate accessories, all these pieces are probably made for Lady Gaga. Although you may miss the excitement and vision of the shows in the past few years, but Sarah Burton has been working a lot on the brand and I hope she could one day can be better with the late Mr Alexander McQueen and bring the brand on another level.